I was born in a Florida Hospital just up the road here on 17-92 between here and Winter Park, May 26, 1934. And my family, my parents had adopted two children. They were married several years, had no children and then I came along; which they didn’t really need another mouth to feed, but what can you do. And, it was tough. My dad had a shoe business going in Winter Garden and had to close it because people couldn’t pay for what they were buying. And he lucked out and got a job with Yowell Drew Ivey in downtown Orlando. And to be close to work, my family moved here and I lived probably the first year of my life in an upstairs apartment on East Amelia Street. And my brother and sister who were about ten years older were enrolled in the Marks Street Elementary School. And he sold shoes there until he could get back on his feet…. He decided to get back to Winter Garden so he did. By 1939, we were settled in the home that I knew in Winter Garden. It was just a modest two bedroom frame home on Woodland Street. I guess they rented it during the time that we lived in Orlando because they didn’t have public transportation at that time for him to go back and forth… We lived there for a short period of time until we could get this deal where we could move the whole family to one location and have our own privacy. 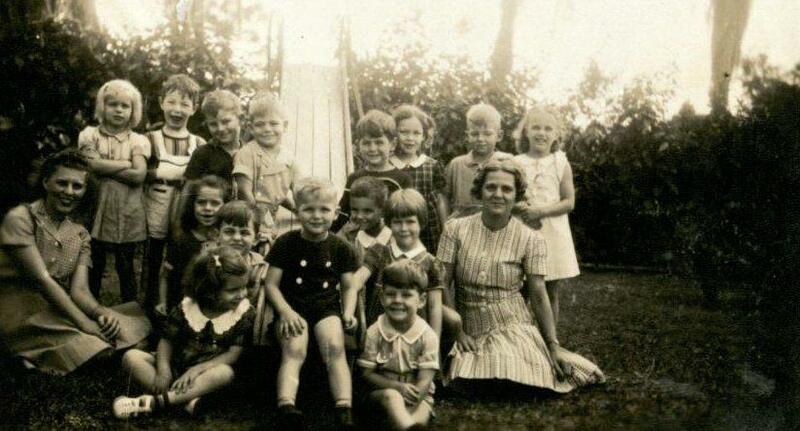 So anyway, getting back to Winter Garden and entering the first grade there, the kindergarten there were several friends of mine, Jerry Chicone being one and Billy Tilden, Bill Irrgang, and several others there that I went through high school with. Jerry Chicone is pictured center and Larry Grimes is third from the left in this 1951 photo of Mrs. Bigger’s kindergarten class. I was living on Lake Butler at the time. My aunt had a camp next door to this permanent house that I was in and she came over and asked me, she said, “I’ve got a young man over here that is visiting my next door neighbor and he wants to learn how to ski. Can you teach him?” I said, “Well, I can try.” So I went over there and she introduced me and his name didn’t ring a bell. It was Elvis Presley. You know, his nice pink Cadillac parked in the back yard of her neighbors. And so, anyway, we got a ski belt on him and I showed him how to bend his knees and get down in the water and keep his arms straight and he got up. My aunt pulled him around our little part of the west side of Lake Butler and when he dropped off we could see right away that he was a pretty slow, primitive swimmer. You know it was just hard for him to make it up on the shore. So we got two or three of us holding hands out and we pulled him in. But I didn’t know who it was. His name didn’t ring any bell. I wasn’t into that type of music, but her neighbor came to Orlando auditorium over here where every Saturday night they would have some band in there and most of it back then was country western type. And at that time Elvis was singing in front of any audience he could get. If it were an auditorium in a high school or anywhere. You know, trying to get himself a name. 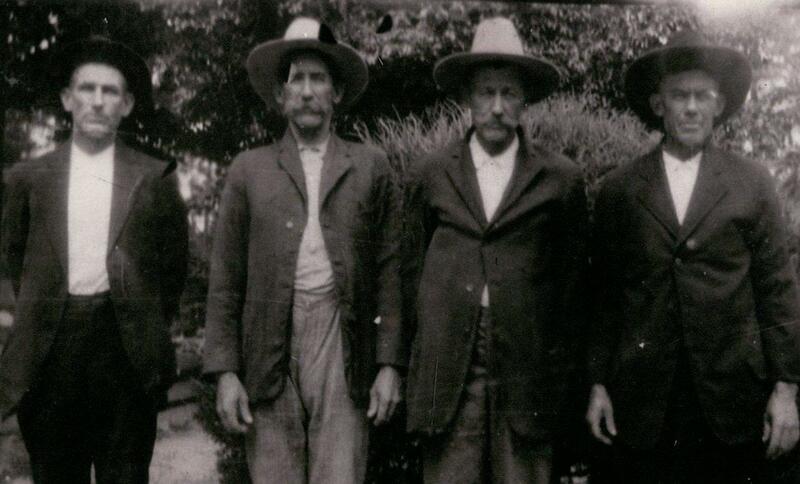 So anyway, to get back to Lake Butler, in 1927 my folks, the Depression hadn’t happened, and they bought a lot on the west side of the lake for a hundred dollars. And you might think, well boy, that was cheap. Well, back then that part of Orange County didn’t even have electricity. So they bought this lot and built a small one bedroom house on there with no electricity, no running water, garbage pit and an outhouse. And my mother would agree to go out there and we would stay as a family for one week and that was it. She didn’t want to stay any longer because of the conditions. And the conditions were that she had a kerosene stove that she cooked on and kerosene lamps. Nobody had air conditioning even in town. And it would be hot and there would be mosquitos and everything else you know. 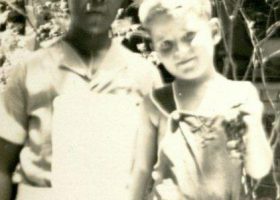 So she’d tough it out for a week and that really pleased the kids, my brother and sister and I.
Lee Grimes, pictured far right, with Pete Richards, center, fishing at Homossasa Springs, 1969. 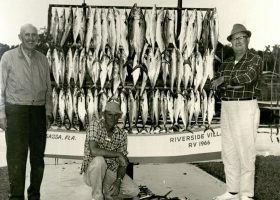 Again, my father was a very avid fisherman and I don’t know why he chose me, I guess I was the youngest, and I had to row the boat and he did the fishing. So I learned after a while to ask for something in return. And he had an old 22 rifle and I said, “Dad, how about letting me take this rifle along and while you’re fishing in one spot I can do some potshots at cypress trees and stuff along the shoreline.” He agreed to that. So then I didn’t mind going any time he wanted to because I was out there having fun with that. And there would be times when just the two of us would go out there. And if he didn’t catch bass he would row over or I would into a little cove there where there were brim that would bed. So, I’d catch a few brim and we’d take them back to the camp and he’d clean them and he’d fire up that kerosene stove that had a glass container on one side of it with the kerosene in it and then a pipe that ran across the two burners were asbestos. And they had wicks that went down into the bottoms there that would absorb the kerosene and after it would set there a few minutes. You know, you could hear it bubbling. Every now and then he’d strike a match and light the unit and then get the frying pan and put it on there and we didn’t have cooking oil. We’d use lard; what everybody cooked with. Put some in there and cornmeal and salt and pepper on the fish and fry them. And then we’d take a couple of slices of bread, there would always be a little hot lard left there with all the crumbs from the cornmeal. And we would toast the bread in that mixture of cornmeal and lard. And that’s what we would eat with the fish. And he and I would sit out there and eat whatever we caught, you know. 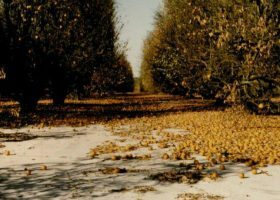 It was at the end of a clay road that was more than a mile to the nearest paved road to get to the west side of Lake Butler. And now, those two lots, I still live on the lake, just sold one down from me for 779,000 and one for 750,000 and no house or anything on them. Just the bare lot. So anyway, growing up in Winter Garden, I’ll try to get back to that. I had a good friend who’s family owned Fulmer’s Dry Cleaners. And when I lived on Woodlands, their dry cleaning shop was one block west behind. 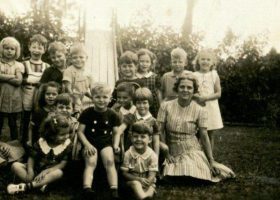 And they had four children and the two older ones would come to work or stay there with the parents when they were not in school or during the summertime. And so, we would play. There was a big vacant lot next to the cleaners. And Roy and I, we found a big concrete structure out there that was probably 4 ft. by 6 or 8 ft. that was kind of buried in the ground. It had dirt in the bottom and then dirt up one side where you could go to one end and jump in it and run up then go around the dirt and jump in. You know, we were like six and eight years old and that was very fun. Well, later on after I grew up and started working with the History Center I realized that that lot was the location of the Bell House which was an old one of those frame hotels that they had in Winter Garden. And this thing that we were jumping in was the old septic tank that this ground there, you know, it had been abandoned for probably 25 years, you now. It was kind of a shock to realize what we had been doing. But, you know, after 20 years of being abandoned and full of dirt it came in when it would rain, you know, dirt would go in there and whatever. It was clean, but still it kind of gives you a weird feeling to think about what you had actually done…. When my mother started coming over here in the late 1800’s, early 1900’s, she told me about how there was a big mud puddle there on the corner of Central and Orange Avenue that stayed muddy the whole time. Well, Winter Garden, they had the elementary school I started first grade in 1940. At the south end of it was a vacant lot and the homeowner next to it kept a cow in that lot, right within two blocks of downtown Winter Garden. And that old cow – see there were China berry trees on the school lot there and there were mischievous boys. I knew some of them. And they would get the China berries and go out there and try to hit that old cow. And she knew just how far to stay away from the fence to keep from getting hit. And, of course, then the schools were unairconditioned. And boy I tell you when it got near May and June you’d burn up in there. And our cafeteria was upstairs and all the classrooms were downstairs. They did have steam heat. But I walked to school from Woodlands Street to the corner of Smith and South Main where Winter Garden Elementary was. And when you walk every day, you know, you look around, and you see things and I noticed in the wet concrete from probably 20 years before that there were turkey tracks all in that where people had chickens and turkeys and cows and everything. And even in front of the garden theater – that’s been totally redone now. I don’t know if you’ve been out there to a program or not, but in the concrete out there, there were cow prints where when it was poured somebody’s cow walked right out there right up town and left those impressions in the concrete…. Years later all the concrete sidewalks were redone and all that was lost. One of the things I recall too, people would put signs in their window, back then in the late thirties, there were a lot of people that still had ice boxes. You’d put a sign, turn it one way and it’d say 10 lbs. Turn it another way and it would say 20 lbs. Well that was telling the ice man what size piece of ice you wanted to go in your ice box. And he would come along and see the sign, whatever it was 10 or 20, in the back of his truck he would take his ice pick and chip out about a 10 lb. piece say. And he had a leather bag with a leather shoulder strap. He’d put that in his bag and he would carry that up and knock on the door and the housewife would let him in and he’d even put the ice in the ice box for you…. The first time I went to a dentist in Winter Garden it was Dr. Arnold. And he had a son a grade ahead of me that was in an FFA quartet that won a first place in the state of Florida. 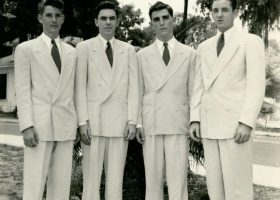 Pictured from left to right are: Larry Grimes – realtor, LeRoy L. B. Hucklebee – pool man, Dr. John Arnold – cardiologist, John Sewall – Orlando attorney. But, anyway, his office was upstairs in what they called back then the Black Building. 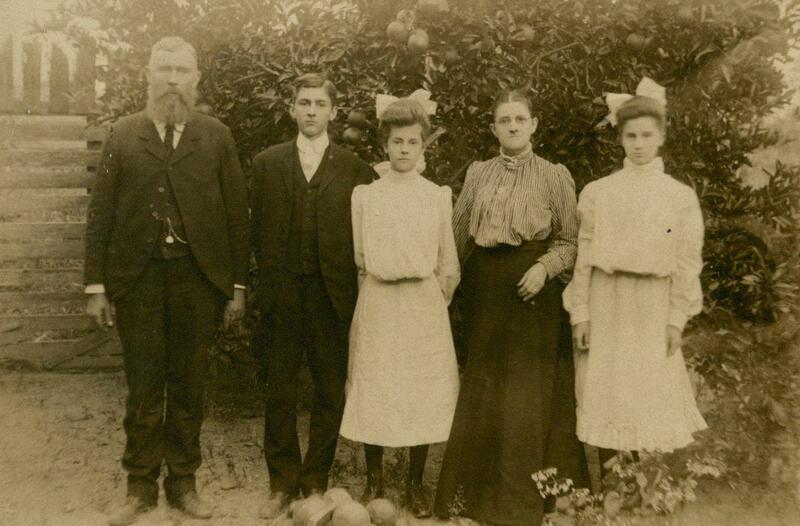 A family in Lake County, I think, built the building. And there last name was Black so it was the Black Building. Anyway, I’d never been to a dentist, never seen inside of one. And I got in that chair and I was about six years old. I’d been complaining about this toothache. And so mother took me up there and I got in the chair and he was going to fill it, you know. And he turned that drill on, well, back then they had two small leather straps that drove the drill and when he turned that thing on, the leather straps were hooked together. There were metal clamps and they would click. And that thing would click, click, click. And boy, when I saw that thing going like that and he was coming at me with it. I jumped out of the chair, took those stairs down three at a time, and I ran three blocks to my granddaddy’s house and hid in the bushes. And they never got me back in there again. 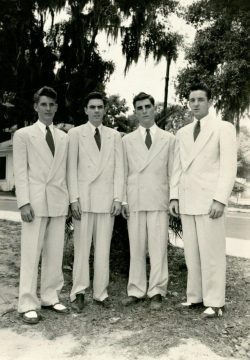 Another trip with some other friends, the Irrgang boys whose family owned Deer Island and John’s Lake in West Orange County, it straddled the Orange and Lake County line. They had a camp just a few doors down [from ours]. And Joiner & Son Auto Parts store, who they’re still operating. They’re probably 70 years old in their business, too. 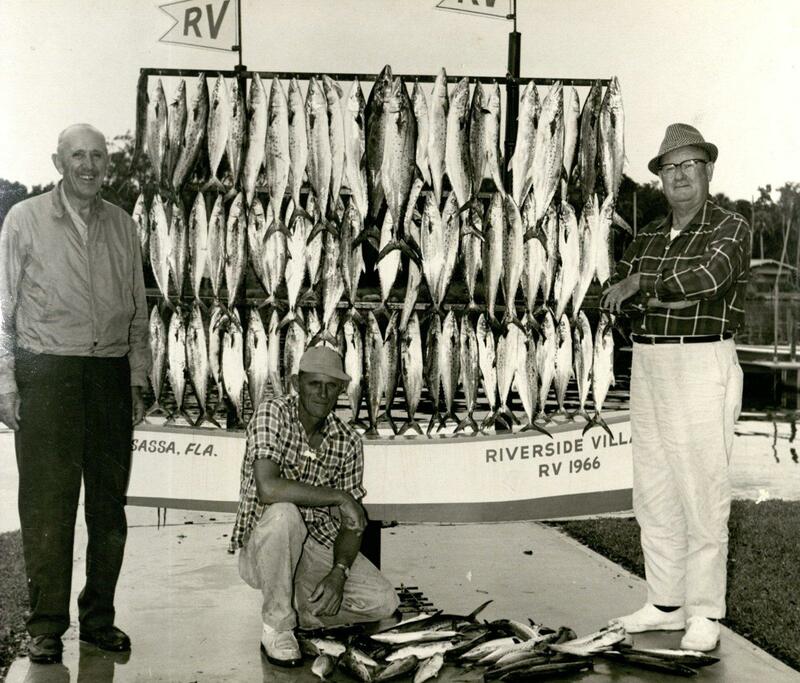 They had a son and we had a couple of other boys went with us and we would trailer our boats to Eustis and put in at Eustis and put in at Lake Eustis and load up our camping gear and everything. Food, drink, 24 cans of Coke or whatever. We didn’t drink alcohol even though we were probably of age. You would have expected that we would have experimented but we didn’t. Nobody smoked either. We’d put in the boat there and go through the Haines Creek which is a canal in the Lake Griffin through the locks in the Ocklawaha River and the Silver Run converge. Here’s the Silver Run crystal clear water and here’s the Ocklawaha black, muddy dirty looking water so you couldn’t miss the turn. And we’d go up the Silver Run and then camp out just below the basin there in Silver Springs. And we made a fool of ourselves when the Jungle Cruise would come by we’d be in the trees and jump out in the water, you know, and holler and all that kind of stuff. We had some of the best times. And you know, nobody had a TV or any of that stuff. Back then, you just thought of something to do to entertain yourself and others…. My junior year in high school I was assistant life guard at the city pool there in Winter Garden and the lifeguard was a senior. And if you can believe it the city would turn the pool over to two teenagers in high school. But, I mean, it was serious stuff to us. We taught swimming in the mornings to young kids and then we life guarded in the afternoon during the summertime. I don’t know what pay he got, but I got $25.00 a week. And man, that was big money to me back then, you know. But, you know, you were there all day and I was in the sun all day…. But that was, it was a great place. And, I think, at that time Orlando did not have a municipal pool. It was built in 1932. 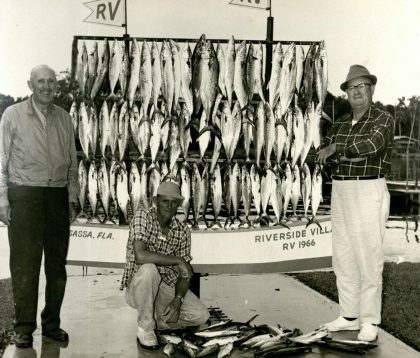 We had a mayor that got funds, federal funds, WPA, and rebuilt the whole lakefront of Winter Garden on Lake Apopka with a seawall, two boat basins, a city dock, and boat houses on each side. This municipal swimming pool which I’d say was close to Olympic size, and a community building, and a hall, a City Hall. It was a place where the high school in those days didn’t have a gymnasium. All of our basketball games were played in what we called the City Auditorium because it had the beautiful, I think, they were the flooring that they use for professional basketball games, maple. And it had a big stone fireplace in one end. There was no air conditioning. So when it was hot, they had these casement type windows that opened up and that’s where we learned to play and played basketball. 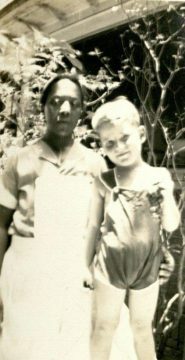 Mrs. Cora Johnson holding Larry Grimes, circa 1940. She was a black lady, but she came every day that mother wanted her. She would do the cooking, she would do the housecleaning, and she would carry me around when I was a baby just like I was one of her own. She was still with my mother when I left for college. And she had an invalid husband that she took care of at home and then she had this job all day long, five days a week…. But bless her heart she was a honey of a person. And when she retired, they lived in a rented, in an old frame house in the Tildenville Quarters. And to keep the cold out they had newspapers tacked to the wall, you know, because there were cracks in the thing. There was like a community well out back and everybody – in that little subdivision type thing it was all frame rental houses – went to that one well to get water to take back. You had the outhouse and garbage pit kind of a thing. And she was only, I’m going to say a couple of years younger than say my mother. But she did take wonderful care of me. And I appreciated her. We had another lady, Daisy Meckins, that came in and did our laundry for us every week. And she would take fat and lye and rainwater and make our soap out of that, you know, and then cut it into cubes. And we had a washhouse out back and had a big iron boiling pot that she would come early and she’d build a fire around that thing. Get that fire good and hot and put our clothes in there. Had this broom handle stick that she would get those clothes clean and then take them out of that with the broom handle and put them into a washtub and then carry them over. We had a little shed there where there was a hand operated wringer. She’d run the clothes through there a time or two and then hand wring them out and throw them in a hamper. And then take them to the clothesline and hang them up, and then take them down and iron what needed to be ironed. That’s just the way it was. I was so fortunate to have had those experiences with her and we had two men, black men, that came and did our yard after our folks got back on their feet…. Well, I’ve talked about everybody but me. I started out when the Army came to Winter Garden, I guess. And myself and a couple of other boys got this idea that there were all these soldiers in town and they had no money. There was an Army camp down on the north side of town and they were uptown on the weekends. So we started parching peanuts and selling them for a nickel a bag. And then after that I got a driver’s license at 14 then another friend and I we had a little trailer and we would go around and buy fruit. Door yard fruit we called it. Where people would have three or four, six trees in the yard. You can’t eat that much citrus. And we would agree to buy the fruit for so much a box and then we would go out and resell it. And then I went like I mentioned to Florida Southern, majoring in citrus. And then I came back and I opened an ornamental nursery and landscaping company and did some landscape jobs and stuff and sold a lot of plants. But it was just taking too long to plant something and have to wait five years to get big enough to sell. So I got an offer to work for the U.S.. Department of Agriculture and I took it. I worked there two or three years and then I got into the real estate. My dad opened our office in 1943 and I came in in 1958 and I’ve been there ever since. And he passed away in 1971. So I kind of took over. And I had two sons that came with me for about ten years and then they wanted to do other things. One of them asked me if I wanted to open a third office because we had two at the time in Windermere. I said, “Gosh, no. I don’t want to run back and forth to Windermere. Why don’t you do it?” He went out and bought a lot and built a building and opened an office out there. Dillard Street in Winter Garden is named after your family, right? But eventually we put it together. And Jerry would recruit me because he figured I had not much to do. I don’t know why he gets that in his mind. But I went with him down into Polk County to see about buying a wooden Indian. Well, he bought this wooden Indian and brought it up here, but it was a western Indian. And he wasn’t satisfied with that because it wasn’t the same type of Indian. Calusa Indian was what was in our area and this was a western Indian. A Navajo or something else, cigar store type Indian. So it stayed in there just a short period of time. Another time somebody says, to call the museum, Lake Apopka’s down now. It’s now a hundred feet from the old shoreline and I see a boat out there about 10 feet out. I’ll get it up on shore if you want it. So we got a trailer and we went over there. The guy had washed it out and everything. We got some other guys and got it on the trailer and got it to the museum and it was part of a display. And it was an old boat that had sunk and been forgotten, no telling for 50 years. But it was made out of cypress so nothing was wrong with it. Still, it’s been cut down some, but it’s still on display inside the museum. But we really have a great time there. Jerry’s got a wonderful collection of citrus labels that he shows every year down there. And he has two citrus label books with his friend, Brenda, they have kind of coauthored the book on the history of citrus labels. And we did a lot. We were on the board and active. I was chairman one time and I guess he was one time. So anyway we tried to do something for Winter Garden. But anyway what I did was miniscule compared to what Jerry did. Because he later helped raise the funds and a lot of it came out of his pocket to buy the land that the History Center now sits on. Because it had belonged to the Baptist Church. Well, when the city bought a city block and tore everything down and built a parking lot right across from the church. The church felt like it really didn’t need that piece of land anymore. It wasn’t very big. So Jerry and a couple of friends bought it and then they started a fundraising deal. But it’s been a wonderful experience working there on that. We have some great people. It’s open seven days a week from 1 to 5. And they are closed on holidays, but any other day Saturday or Sunday you can go out there and children love it. We’ve had Kay Cappleman that did tours with our school children and she had the history of downtown. She had repeated it so much it was like turning on a phonograph or something, you know. And she could tell about all the buildings that used to be here, you know. Thousands of kids have gone through that. And we don’t get any tax money. It’s all run by volunteers and donations and that’s the way we want to keep it. It’s a wonderful organization. That’s it. The wonderful trail that they have out there, the bike trail. And we have a city manager that was the spark plug. He was a local guy, but he was retired military and boy it was military right down the line. And he would get things done you wouldn’t think possible. He wouldn’t take no for an answer. You know whether it was public or private because he had a goal of what he wanted to see done. And my family happened at that time to own where the trail hit. And we made a deal for the county to buy that so it could be the trail head. J. L. Dillard pictured with his wife, Mattie Showalter, and their children, Marvin Dillard, Mable Dillard, and Gladys Dillard, far right. That was the last of my granddad’s estate was that piece of property. That was your family’s property dating back to the 1800’s, right? Yeah. 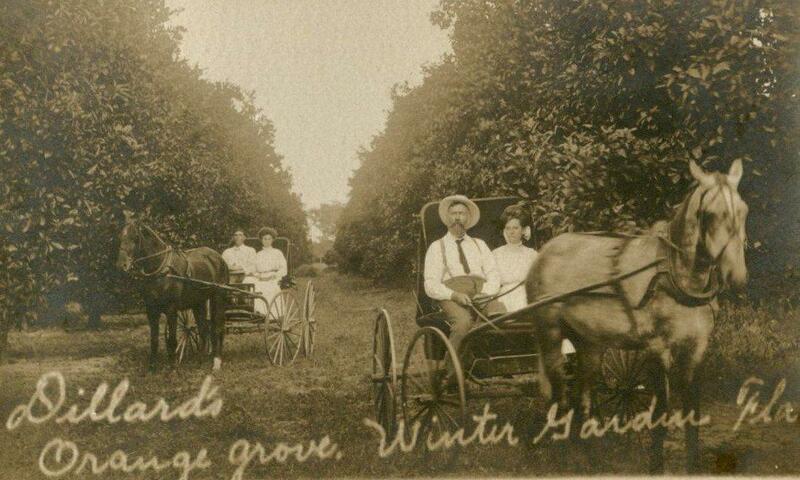 His house was there on Midland and Agnes and then the rest of that part east of Dillard Street was all orange groves. 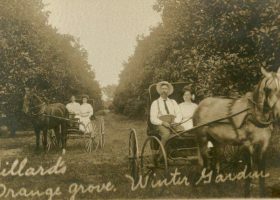 The Dillard family in horse carriages in the Dillard family groves. 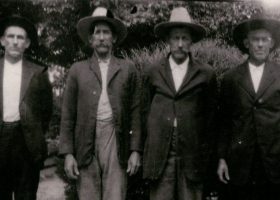 J. L. Dillard and his wife are pictured on the right. Bob Waterman and Gladys Dillard Waterman are pictured in the carriage on the left. And, like I say, after he passed, well, the three children divided the rest up into a subdivision called Showalter Park after their mother’s maiden name. Which, she was, Mattie Showalter, his first wife. And so, that one little place was left because it was separated from the other. So that just made it ideal, beautiful place. The orange trees that used to be there now are replaced with oak trees because birds and squirrels would drop their acorns across where the orange trees were and that’s where oak trees sprouted and grew up. 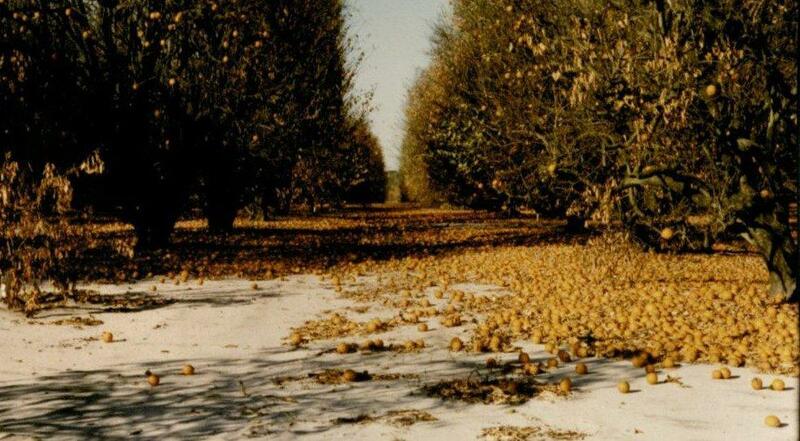 And they look like they were planted in rows. An orange grove in Winter Garden. I can’t believe, back in my day, Saturday was “the” day. And that’s the day everyone came to town to shop and get a haircut, and that sort of thing, do their grocery shopping. The grocery store delivered groceries to midnight on Saturdays. And kids, I heard on one of your recordings… it was Charlie Wells that mentioned you could go to the Rialto or one of these other theaters here for 9 cents. And that’s exactly what we used to pay. And on Saturday that’s where the parents deposited their kids you know on Saturday afternoon. You’d give them a dime and they’d still have a penny for a penny candy, you know. So those were great days. But Winter Garden went through a period there in the seventies when we had vacancies left and right downtown, things boarded up. The hotel was a pigeon’s nest and it was about to be condemned from the city. Somebody came along and rescued it. I was involved in that. It was a friend of one of my sons that does professional makeup. He knew somebody at Universal that wanted to buy something like that and he had a realtor. But we both agreed that this was something that needed to be done to save the building. That we wouldn’t participate in anything. We would do what we could to put it together. The same thing with the theater. Jerry and I drew up a contract with a couple of other guys. We went down and talked to Herbert Pounds who owned the building and they were using it for tractor storage at the time where the theater was. And there again we didn’t get involved in taking any commissions or any of that sort of thing. This was a community thing that we wanted to see happen because I went to that theater. I wasn’t allowed to go to movies on Sunday, but I could go any other day of the week. But Saturdays always I went because that was when they had the cowboys and the serials and that sort of thing. One other story about theaters. Doctor Arnold had two sons, one that I sang in the quartet with and he had an older son, Lester. And when they were building Highway 50 through the lakes and everything going west back in 1947, I think, “Gone with the Wind” was playing here at one of the theaters. So, we decided, boy, were of age now. Boy, we were 16 and they’d let us in. Because someone was going to say “damn” and we wanted to hear that in the theater. And now days, you have to go and take earplugs to keep from getting insulted when you go to the theater, any of them, you know, unless it’s a Disney movie. But that was a big deal to us to go over and hear somebody say, “damn”. But we came over in the Jeep and we went back by Jeep. But this time, instead of the Old Winter Garden Road, we decided to try this new unopened road and we went over the piles of sand and through the deep ruts where they had poured the sand across those two lakes that you cross. You know it took us an hour or so to make it. But that was more fun than you can imagine going back that way…. You still live in Winter Garden and you just had a history event, right? Yes. My wife portrayed my mother, Mable Dillard Grimes, and being raised in Winter Garden. And I transcribed a record of her that I made in 1977. At the time she was 86 years old, but bright mind. 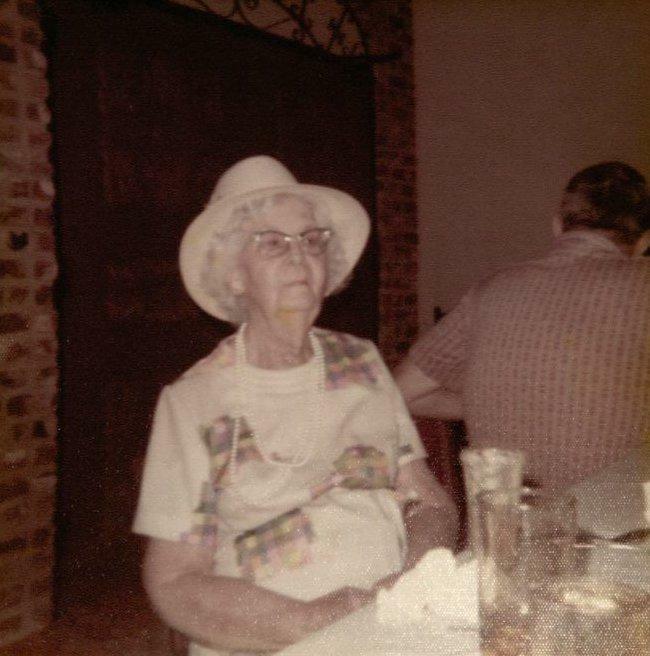 Mable Dillard, born in Winter Garden in 1891. And she could remember intricate details of growing up in Winter Garden. And that’s really another whole story, but I did bring you a copy of a transcript. I’d like you to keep it if you’d like. VIEW Transcript. And so, anyway, that was a nice event. They have those and we have a room that will seat 60 people and for small events it’s an ideal setting there. Oral history interview with Larry Grimes at the Orlando Public Library, February 20, 2017. 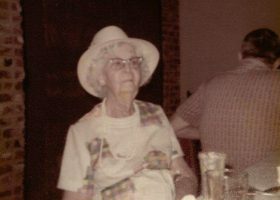 Early times in Winter Garden... "30 Minutes with Mabel Dillard Grimes," 8/10/1892 to 12/4/1983 as conducted by her son Larry Grimes. Listen as he recalls the interview in this excerpt from an oral history interview with Larry Grimes at the Orlando Public Library on February 20, 2017.